September 15th, 2016. I've been doing quite a bit of teaching and writing lately. 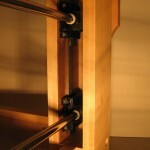 I just started blogging for Popular Woodworking on the topic: Digital Woodworking. How woodworkers can use new digital tools int their workshops. To read the blog and to follow it, go to PopularWoodworking.com's website. September 15th, 2016. Yup. A new workbench. Recently, I volunteered to design, prototype and help members build several workbenches for a new community facility. It gave me a chance to work on a new design for a bench that was on a budget, was easy and fast to build and would fit a large variety of tasks. More info about this, soon. September 15th, 2016. I'm teaching a class next month at the Seattle Woodcraft store. Class dates are October 23th, 2016. It will be a one day class as an introduction to CNC Woodworking. Students will get a quick introduction to Digital Woodworking. What's needed to get you on the right track if you're considering adding a CNC. Demos will include a CNC made toolbox for every student. See the Woodcraft Website for more details. October 20th, 2014. The just released August, 2014 Finewoodworking issue (No. 241) has the first of two articles I've authored for the magazine. The article titled: "Smart Jig for Pattern Routing" features a jig I've developed over the last decade that makes pattern shaping much easier and much safer. It's been a great jig and I encourage every woodworker that uses a shaper or router table to consider building one. Here's a link to FWW Extras site that features a video that shows how it works. The second article is about using the Festool Domino in Furniture Making appears in FWW issue 242. It also involves making a unique jig tht makes joints more accurate. June 3rd, 2014. Apologies for it taking so long to build a new version of this site. Too much work in the shop has been keeping me away from this site for a while. Coming in a month or so the new version of WorkbenchDesign.Net will be ready to launch. It's a completely new design and will incorporate many, many new features including reader forums designed for sharing our workbench experiences and ideas, the ability for readers to upload their favorite benches and tons of new plans and links to useful things. Good things to come so stay tuned. Eddie Tom Caspar has done it again. He was the designer of my first workbench Workbench 1.0. 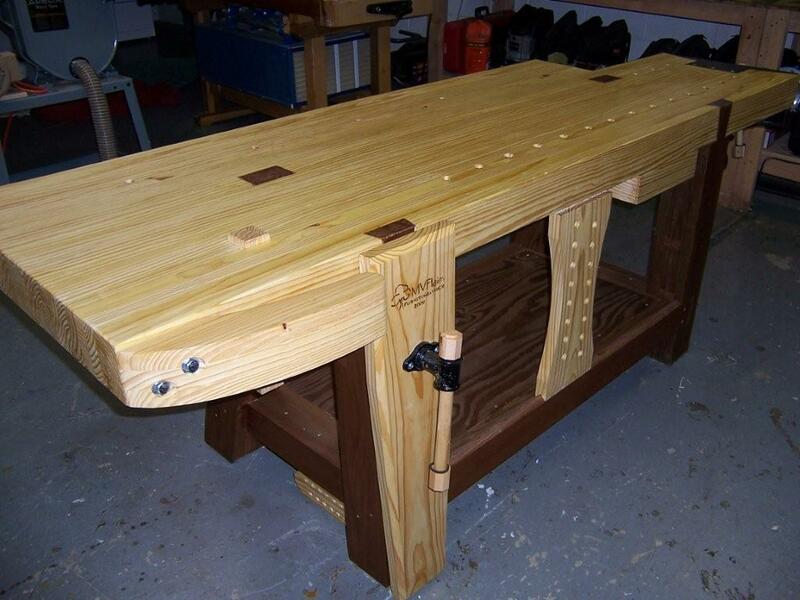 He's created another outstanding inexpensive workbench that can be easily built by a beginner. And, though it's low cost it's a serious workbench. It's super flat and very stiff. Make sure you check out the latest American Woodworker Magazine (#156) to get the bench plans. To see the bench in action see the video here. Popular Woodworking has a very good deal that includes Chris Schwarz' Workbench and Workbench Design Books, plus 3 workbench plan CDs and a great poster in a bundle. I've bought all these books and plans as they came out and can tell you personally that they are indeed excellent. Great chance to put a lot of workbench information in your woodworking library! Much is going in regards to the design of the next version of WorkbenchDesign.net. Already you can keep up with WBD via Twitter. Now, I've added Facebook to our presence. Just click on facebook.workbenchdesign.net for the latest info in the world of workbenches and click on "like" to follow the latest in the world of workbenches. A traditional leg vises excel at clamping longer work horizontally (especially when used with a board jack) and they have a very generous working depth from the bench top to the screw, typically around 10 inches. The lower fulcrum arm allows the vise to generate high clamping forces; unfortunately you must insert a peg into a series of holes in the fulcrum arm to adjust the vise to various workpiece thicknesses. Len has come up with another solution that eliminates pegs. Like his twin screw vise, it is very clever engineering. It's hard to explain here, but, his website has all the information and a video so you can see how it works. A very interesting new wagon vise is now available from Lee Valley. It appears to be a simple installation and can be retrofitted to an existing bench. Because of its small size, ease of installation and low cost, there may be some very interesting applications for this unique vise. Chris Schwarz been testing it for quite a while and has his observations here. And, for more detailed information here's the link to Lee Valley's page. Inspiration: Greene & Greene Furniture: Poems of Wood & Light. Just so you don't think that I only think about workbenches I do actually build furniture regularly. One of the styles of furniture I like to build is in the style of two Arts & Crafts period architects: Greene & Greene. For those unfamiliar with their work you'll find lots of great info with a google search. And, if you're in LA make sure you visit the Gamble House. 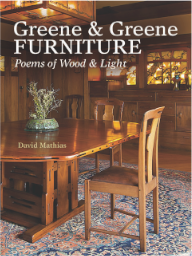 If you really want to learn about this outstanding furniture a new book by David Mathias just came out called Greene & Greene Furniture. It's a great book written by one of the most knowledgeable experts on their beautiful furniture designs. It is filled with lots of information and great photos and for any woodworker it is sure to be great book to have around to learn about this great style and for inspiration for what to build on top of your workbenches. New workbench books don't come out very often. And, when it's written by Chris Schwarz, one of the most passionate fans of workbenches, it's certainly worth a serious look. So, I've gotten my hands on a copy and reviewed this excellent book. A new tail vise design doesn't come by very often. As with most things Veritas this one seems to be very well designed and very clever. 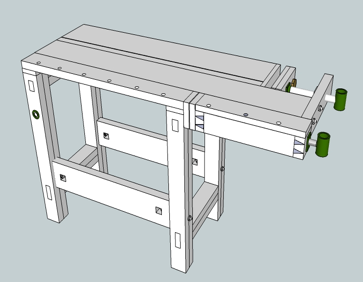 Using a combination of sliding plates and cams, this unit is not only a quick release design but can also be retrofitted on to an existing bench. Considering how difficult it can be to mount a tail vise even on a new bench this is quite an accomplishment. I really like how it puts the dog holes very close to the edge. It's not often that someone comes up with a new engineering approach to vises, but Len Hovarter has done just that. 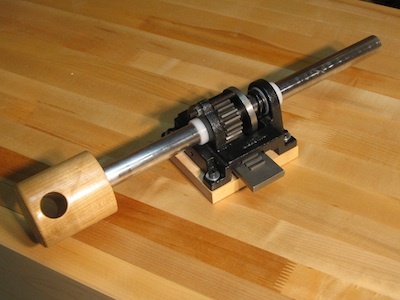 Len is an engineer and woodworker who's created a twin screw vise that uses a clutch mechanism rather then screws and a rack to keep both handles aligned. The result is quick release vise that works very well. He's just launched his website and taking pre-orders. His site has more information and a video of the vise in action. Check it out, here. Englands's great workbench maker has made available a video of his latest workbench, The Artisan put through all its paces. Also, he wrote to tell me that he's now turning his own woodscrews for his benches. Check his site out here. Yes, it's possible that some people have a problem with workbenches. What outsiders call "an obsession" with workbenches. Frankly, I just don't understand what these people are talking about. But, if there is one of us who actually should join a 12 step program, it's Chris Schwartz of Woodworking Magazine. (At the meetings we just call him ChrisN.) He's created a seriously beefed up Roubo for the August issue and he's covered some of its construction in his blog: Check it out, here. For those of you that might want to take on building one just like Chris' he's got a DVD with videos and all the info coming out soon. It's a really great bench. As you look around the site, you'll notice that we have a new site sponsor: Benchcrafted. Jameel is the maker of terrific vise hardware and workbench plans. Serious tools for serious workbench builders. He's got a great blog, too. Do check them out. David Randall had a workbench design problem that a lot of woodworkers have: Very little workspace. He needed a short bench but wanted the ability to work all around his bench. In process he not only built a solid bench out 2-by material but also created a very unique vise arrangement that combines a tail vise and a shoulder vise on one end. Very clever! Check it out, here. Darnell Hagen has built a particularly nice bench. As they say..."it's all in the details. 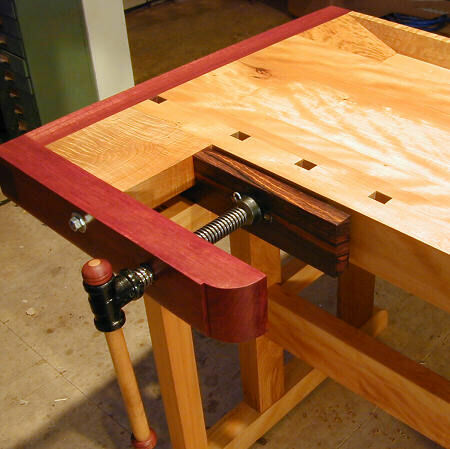 His Cabinet Maker's style bench has a nice cabinet below, an imbedded Tucker Vise and even an adjustable cup holder. Check his design and plans at his website. Jameel at Benchcrafted has done it again. Not only does he make some of the finest bench vises made anywhere, he has now added a workbench plan to his collection. 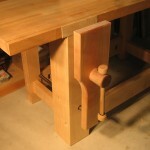 Based upon a modern split Roubo style bench it features his terrific leg and tail vises plus several other unique features. It's a massive bench at 4" thick and 87" long. I've had the pleasure of seeing one of these benches being built by Jim Tolpin. The plans are most impressive at 28 pages and are incredibly detailed and a complete hardware package is available. Most impressive. Check them out here. Garrett is one of the best woodworkers in the country. 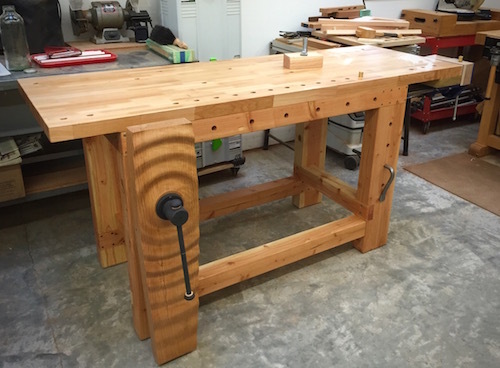 He's created a new workbench that will especially appeal to hand tool focused woodworkers. Here's a link to the article and a video tour. It's always hard to find good woodscrews of the size and quality needed for building a traditional style workbench like a Roubo or Holtzappfel twin screw bench. Most of the available screws aren't seriously large. 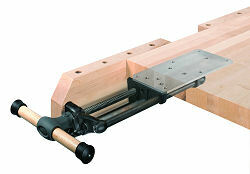 Now, Nick at Lake Erie Toolworks is offering 2 1/2" diameter wood vise screws. That should do it! James Krenov, a legendary woodworker, author, and founder of the College of the Redwoods Fine Furniture Program, died at 89. Michael Dresdner, eZine Editor interiewed workbenchdesign.net for the magazine's latest issue. Find out about the history behind this website. With so much going on maybe you'd like to keep up to date with new workbenches being created. 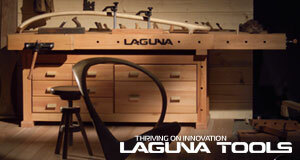 Follow the bench design and building process on our workbenchdesign Twitter feed. 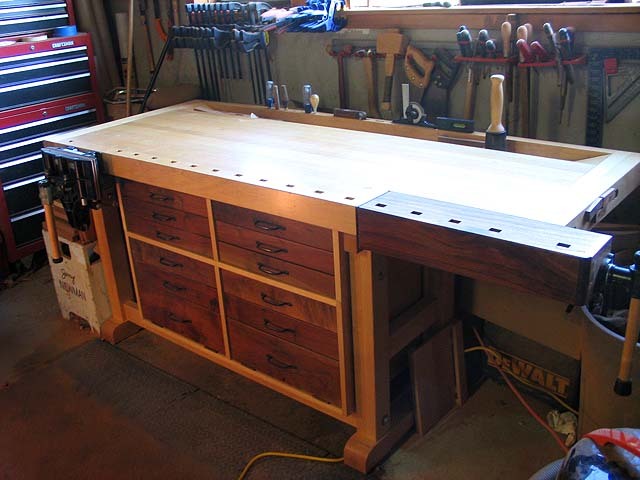 Richard Maguire has added to his line of very robust workbenches with a Dominy/Roubo modern design. Great looking bench. He's working on making these easier to ship to the US. Very nicely done! I don't think I've ever seen more robust workbenches then Richard Maguire's. Made out of super dense steamed English Beech, featuring massive legs and 4" thick tops and traditional construction, these benches are incredible. He offers both Roubo and Dominy styles in various sizes, all built to order. Note that shipping from England could be a consideration. Considering that the well-tested designs we're using for contemporary benches are 3-400 years old, it's not often something comes up that's really new in the world of serious workbenches. Leg vises are one of the most ancient of workbench vises. Jameel at Benchcrafted who already offers wonderful wagon tail vise hardware has now created new leg vise that's really exceptional. Check it out here. I'm always on the look out for really good free workbench plans. So, I've been working for a while to create a collection of the best 3D CAD ready SkechUp free workbench models I can find. I've culled through them to create a collection that I think would be of great interest to our viewers. I'll continue to refine this collection and keep it to the best workbench designs. Click here to see more. I've been doing a massive update of the site before the redesign and have added many, many excellent new plans both for sale and for free. Be sure to check them out. For those woodworkers that really like to work with hand tools, Mike Flaim's new bench is a real treat. He combines details from Roubo benches from Christoper Schwarz and Roy Underhill with several interesting ideas of his own. I thought mounting the Emmert vise on the end was a great idea. A great bench for handwork and it's built with readily available materials so it's not expensive to make. Mike has thoroughly documented the process on his blog at Fine Woodworking. Click here to see the full story. Another interesting new portable workbench: The Skil X-Bench Workstation. 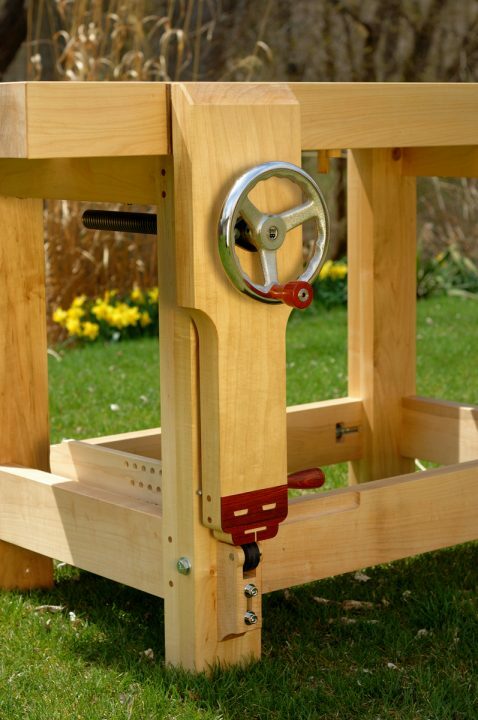 This one has many optional features that might be of interest to woodworkers. There's various accessories and inserts for routers, jig saws, sanders, tail vises, storage, etc. And now for something completely different. I've created the first of many new designs for shirts, mugs, bags and the like. Check out the first of the designs here. A very interesting new portable workbench: The VIKA. In many ways you can think of this as a very well designed new take on the Black & Decker Workmate. Though it doesn't have a built in vise, it makes up for it with lots of new features. I saw these at Costco a few months back and just had to pick one up. It folds flat and adjusts in all kinds of ways. Very useful. You can get more information and order one on the VIKA website or if there's a Costco nearby you can pick one up at a considerable discount. A very interesting new portable workbench by Blum Tools utilizes a torsion box design and pipe clamps for it's vises. Very clever! A new traditional workbench plan is available via the editors of Wood Magazine. It features two front vises. It's not often that something innovative shows up in the small world of workbenches, but it looks like BenchDog makers of a very nice router system has come out with a line of very interesting workbenches with lots of options. Click here for more info. The wonderful Record vises are alive and well. Hurray! Apparently, Record sold its' vise patterns to Anant and they are now being produced in India and the quality is reportedly good. They are sold by Amazon.com and Highland Hardware. Thanks to Steve for the tip. For example, the Record 53ED sells for $119.95 plus shipping. Click here to go to the vise page for more info. Woodsmith and Shopnotes Magazines now offers a free easy-to-build workbench plan. The free workbench plans section has this and several other free workbench plans including a great new one from Popular Mechanics to check out. Workbench Cabinet details shown above. Click the photo for a larger image. This cabinet is built in two sections and fit's snuggly on the maple stretchers at the base of the bench. For more details and photos of the cabinet, just go to the Details section of this site. Ellis Walentine's beautiful new bench. Some great photos of the famous Frank Klausz Workbench as executed in bloodwood and figured beech. A clever way to create a very solid, thick laminated top was posted by on the Workbench Design Forum. Eric laminated together two inexpensive Ikea laminated countertops to create his workbench top. Check out the posts on the "Show Off Your Bench" section of the Workbench Design Forum for photos and more information. Some very interesting new workbenches have become available for those that would rather buy one then build one. Lie-Nielsen manufacturer of some of the best handtools made today now offers a really well made workbench and excellent quality bench hardware for the builder. And, a new series of benches made by Waldman offer heavy duty benches at an attractive price. Check out Ready Made for more information. A greatly expanded woodworking library called Great Woodworking Books has been added to the resource section of this site. Besides the previously recommended books on workbenches, I've added selections on workshop design, woodworking inspiration and woodworking techinques. By no means a complete collection, I've kept the focus to just what I think are the most important books for all woodworkers and the most inspiring to my own woodworking. I think you might enjoy these as well. My completed second workbench. Workbench 2.0, btw. I've written about my experiences in designing and building it. I've added some detail photos for those that requested it. If you're taking on building a serious workbench, you can see how one person's thought process went into the design and execution of modern European style workbench. Since it's inexpensive and a great beginners bench, I've added photos and a small article on Workbench 1.0, my first woodworking bench. The article and full plan is now available for downloading. Free Workbench Plan. Build it in a Weekend. I did! Some terrific news for workbenchdesign.net readers. Tom Caspar, editor of both Woodwork Magazine and American Woodworker is the author of the wonderful Workbench in a Weekend article and plan mentioned on this site. He has given permission for us to make the article and free workbench plan available for downloading. Go to the Workbench 1.0 section to read about it. This is a terrific bench and was not only my own first bench and woodworking project, but also helped instigate my career as a fulltime furniture make. Highly recommended!